Vincent van Gogh is a post-impressionist Dutch painter known for his beautiful depiction of nature and the use of different pigments for his works. His career was short living but he produced over two thousand works in this short span of time. His popularity grew immensely due to his nature paintings, landscape portrayal, self-portraits and portraits of people. The amount of brushwork involved in the paintings of van Gogh is exceptional as one could find in his self portraits or The Starry Night or Irises or The Potato Eaters. His subjects were simple but the way he displayed them after completion of his work is beyond the expectations of human mind. Irises are a subject that has fascinated Vincent van Gogh throughout his life and he has done different works about the same subject. The most famous one was done by Vincent van Gogh in the year 1889 where he was undergoing rehabilitation for his mental disposition in an asylum. It is unfortunate that his fame as an artist came after his suicide and people who thought of him as a madman sketching base thing began to understand the genius of his work. 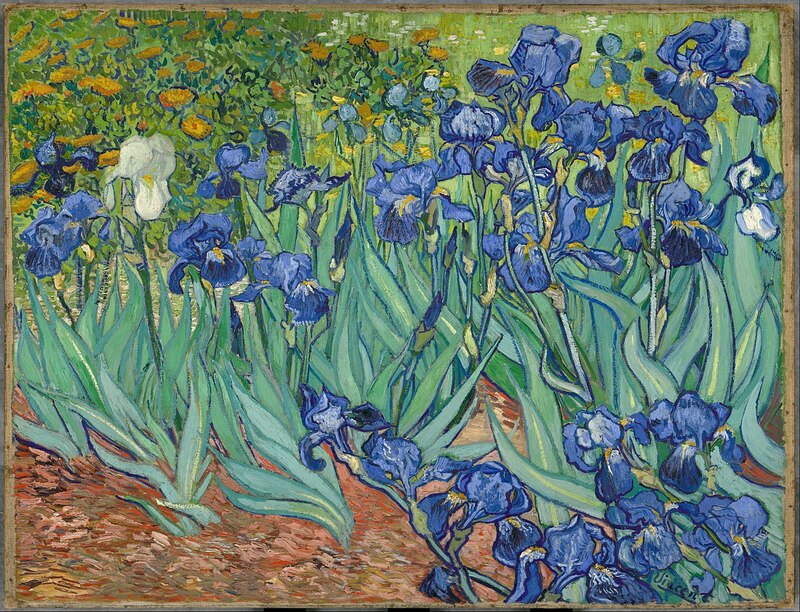 The Starry Night and Irises were done during his time in the asylum and just before the year of his death. People realized the greatness of these works and started to acknowledge van Gogh as a master. His depiction of landscapes and use of brush work has paved way for modernistic art. In the asylum, van Gogh felt that the inmates are conscious enough to politely respect his work and privacy. This made him concentrate on the subjects he intended to draw and resulted in the production of Irises and The Starry Night. During the time Japanese wood block prints or ukiyo-e was a major influence on the artists and the same can be observed in the Irises as well. The woodblock prints had an immense depth, innovative colour projection, novel angles and strong outlines. All of the traits can be found in the work of Vincent van Gogh and it is a vibrant depiction of the flowers, leaves and the background. The painting consists of a plant with flowers with the background resembling the garden plants of the asylum. The majority of flowers are found to the right side of the painting [from the view of beholder] and the left bottom has a vacant field with grass allowing the viewer to completely grasp the scene as if he or she is standing in the garden. The vivid colour strokes, free flowing irises and the simple background lets anyone feel the presence of the breeze while watching a beautiful show of flowers in a garden. It is interesting to know that van Gogh did not consider this particular painting as a serious one and said in his letters that it was only for study. Hence, one could not find drawings or sketching for the painting. It is raw, unstructured and pure resemblance of nature. The potential of the painting was recognized by Theo his brother who submitted it to an exhibition along with The Starry Night. Many critics applauded the work and the works of van Gogh came into popularity. Unfortunately, van Gogh was not alive to enjoy the fame as he died in 1890 leaving an ocean of works to get inspired with.